Russia’s top law enforcers, the prosecutor general and the head of the Investigative Committee, entered the Russian parliament on Wednesday and addressed the session to announce charges against the youngest senator Rauf Arashukov. The 32-year-old politician tried to escape by running upstairs, but was ordered by the chairwoman to return to his seat in an “icy voice,” according to witnesses. He complied with the order and declined an opportunity to address the house. It remains unclear why he didn’t avail of his legal right to defend himself. Later, during the interrogation, Arashukov made surprising claims that he doesn’t speak Russian well enough and demanded an interpreter. There were dramatic scenes as four officers, representing the Investigative Committee and even the security service, FSB, came into the assembly hall and approached the embattled senator. 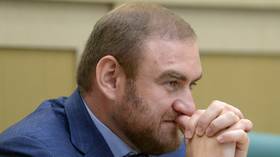 Other Upper House members, who had just ruled in favor of stripping him of parliamentary immunity, watched as Arashukov, a tall, strongly-built young man, stood obediently, without lifting a finger. Then the officers surrounded him and walked him away. Video, released by investigators, showed him arriving to the Investigative Committee building, already handcuffed. The senator, who represents one of the republics of North Caucasus, faces several criminal charges including murder, corruption, and racketeering. The dramatic arrest kick-started a large-scale police operation involving searches in several Russian cities on Wednesday. The politician’s father, gas mogul Raul Arashukov, was arrested at his office in St. Petersburg in relation to the alleged embezzlement of $450 million. Investigators allege that Arashukov Jr was involved in the contract killing of a political activist and local politician in his native Republic of Karachay-Cherkessia in May 2010. The senator became a suspect in the case as the person who allegedly ordered the murder after one of the hitmen who carried out the killing turned himself in last August, RBC news website reported. Meanwhile, UAE authorities have also launched an investigation into Arashukov in connection with alleged document forgery.